Taylor leaves no doubt as to where she'll play her college softball! 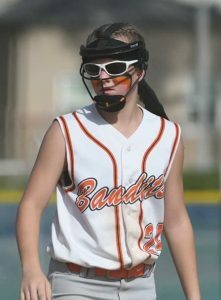 It’s not surprising when Taylor Pannell, an infielder from Milan, Illinois who plays with the Beverly Bandits and is committed to the Auburn Tigers, admits the color she favors most in her wardrobe is orange. 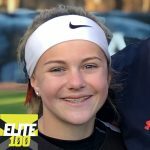 The outstanding 8th grader—who was rated in the Top 10 of her class by Extra Inning Softball—could have gone to any Power 5 Conference she wanted to and in this exclusive player spotlight reveals what it was about Mickey Dean’s Tigers that swayed her to the SEC school. Taylor looking stylish in her white-framed shades. What did you do for spring break this year? This Sunday is Easter… does the holiday have any special meaning to you and if so what? Holidays are when I can spend time with my whole family and do not travel for softball. My little sister and I always watch the movie Hop and eat candy. I go to my grandparents for Easter Egg Hunts, too. I went down there for a visit and really liked the campus. It seemed like the perfect place for me. After all of my visits I knew it was where I wanted to go. I called Coach (Mickey) Dean and told him I wanted to play for him in college.